Belle Epoque necklace with emerald drop shapes pearls and diamond closure: Description by Adin Antique Jewelry. 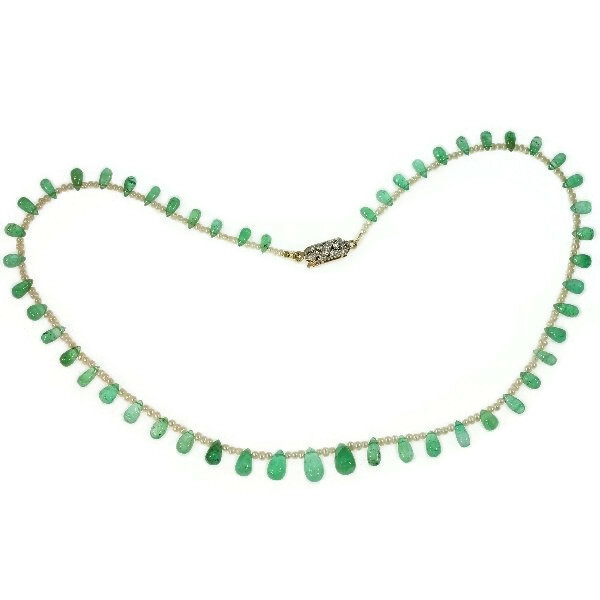 This Belle Époque necklace from 1910 is composed out of 52 degrading pear drop shaped Colombian emeralds and three seed pearls in between each gem. Its 18K yellow and white gold closure encrusted with nine single brilliant cut diamonds grants you to receive a touch of spring around your neck. Diamonds: Nine single brilliant cut diamonds (also called 8/8) with a total estimated weight of approx. 0.18 crt. Total diamond weight: approx. 0.18 crt.